Hi everyone! I hope you week is going well. We have a week full of family and wedding activities and we are very excited about that. 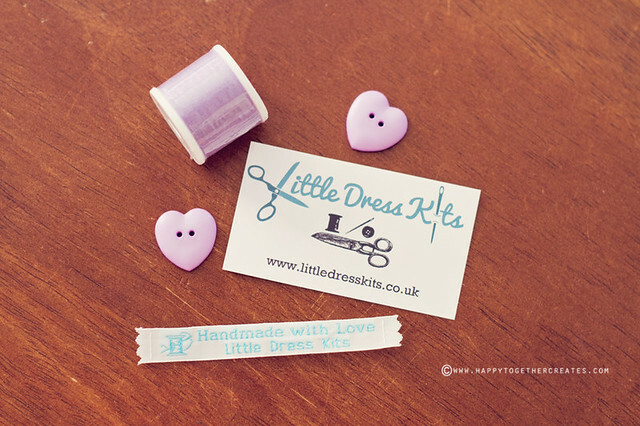 I wanted to pop today and share this cute little dress kit c/o Little Dress Kits that I made for miss E (all opinions 100% my own) and give you a chance to win one of their kits too! Katie is the creator of these kits and got the idea when she was pregnant with her daughter. She wanted to sew things for her baby, but was a beginner sewer and was very frustrated with the patterns she was using. So once she got some sewing experience, Katie decided to create kits that would make it easy for anyone to sew a children’s clothing. I was really impressed at how clear the directions were and I loved how she puts the patterns on adhesive paper. You just peel the pattern off, stick it on the fabric, and cut it out. Super simple. The adhesive paper came off easy and I stuck it back on the adhesive paper backing when done to save for another time. Laying down pieces before removing the back to stick them on fabric. I can totally see miss J doing this as one of her projects. In fact, she was a little upset they didn’t have a kit in her size lol. 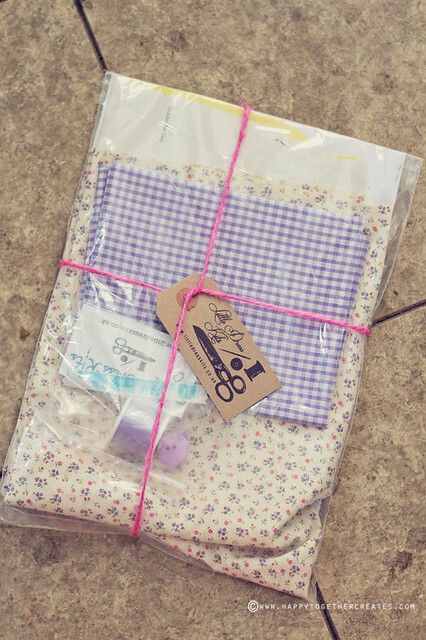 The kits also come with all the supplies you need: thread, buttons, fabric, label, etc. There are kits for boy clothes and kits for girl clothes. I made the Reversible Tie Side Pinafore Kit for miss E. I love the retro feel to it. It is for sizes 12/18 months size and it fits her still as a size 3. It would be more of a dress on the 12/18 month old, but it’s more like a top on her now. I made little pants to go with the top (tutorial here) using a wonderful breezy cotton gauze i found. It matched perfectly. Now she has a super cute outfit. What a great idea! I can sew but sewing clothes intimidates me. I tend to stick to straight lines (i.e. pillows, elastic waist skirts) This would help me branch out in sewing for my girls. Super cute! I sew lots of stuff for my girls, but I think this would be a great project for my mom. Super easy and she wouldn’t have to run all over town for supplies! OH my gosh, that is SO Cute! 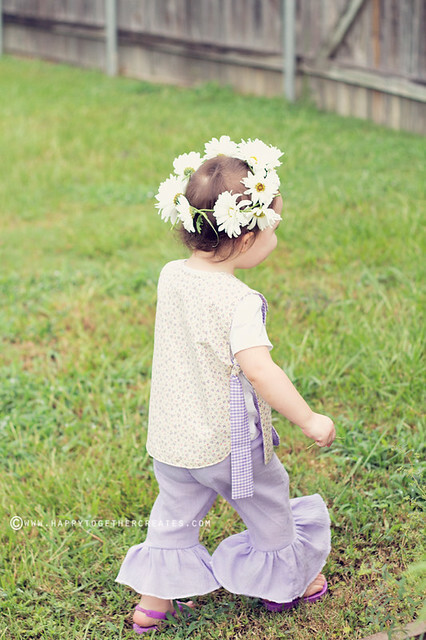 I am taking a sewing class and I would LOVE to make my little punkin an adorable outfit!!!! What a neat idea! I wish I had come up with that. I would love to make a kit for my baby girl. How sweet! Your little girl is such a doll! So sweet! I love the Sweetheart Dungarees kit! That’s such a great idea! I would make it for my future niece. Thanks for the giveaway! I’d sew some little dungarees for my new nephew! So gorgeous! What an inspirational mama/business woman/designer. What a super sweet dress! 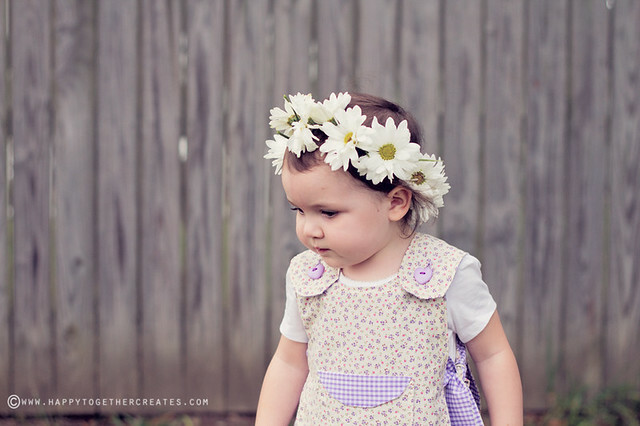 I’d sew the Pinafore dress for my little niece. She is such a little lady and loves her skirts and dresses. I would buy the Reversible Tie-Side Pinafore Kit. My grandma made me one of this when i was little. It brings back good memories. such a great idea! i was thinking this would be perfect for my little niece who is learning to sew. I’d love to make that Santa sack or pinafore or nurse apron! I would make a pinafore for my daughter in a heartbeat! I love the idea of the sticky pattern pieces. Saves a step for me because I love tracing my patterns onto freezer paper to iron onto the fabric to achieve the same result! I love the Reversible Tie-Side Pinafore kit. 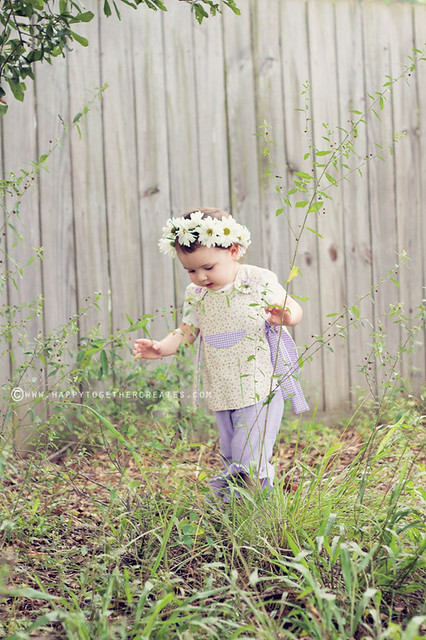 What a gorgeous little outfit and would look just lovely on my little girl!! My niece was born a few weeks ago, and so I would love to start making her some clothes now that she can fit into once she grows into them. So sweet! Would love to make for one of my girls! I’ve never sewn, ever. I’m intimidated and not trusting of my cutting skills, to begin with, so having a kit and easy-to-follow instructions is ideal to get my feet wet! my daughter would look beautiful in this kit! purple is our favorite color! beautiful! my daughter would love it.